ac&e delivers aerodynamic and hydrodynamic anysis through its exclusive UK distributorship of VSAERO, developed by Analytical Methods Inc (AMI). 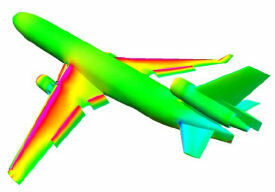 VSAERO and its suite of sister codes offers fast turnaround computational fluid dynamics capability for aerodynamic and hydrodynamic applications. The ability to calculate internal and external flows, non-uniform inflow and body rotation makes VSAERO applicable to fluid flow problems in aerospace, automotive and marine engineering. VSAERO has been a key factor in the development of notable air/land/sea craft, including Rutan Voyager and Beech Starship aircraft, the Stars and Stripes racing yachts and the Sunraycer solar automobile. For aerodynamic preliminary design, we offer MGAERO, part of the AMI suite of aerodynamic and hydrodynamic products which enables you to rapidly model and analyse the most complex configuration. You can develop MGAERO input using geometries as sectional data, wireframe components or IGES files from CAD systems. Rapidly assess new designs, analyse new components on existing aircraft, and dramatically reduce your design cycle time.